The world is changing rapidly and for Kiribati this presents unique challenges. Young people and adults are increasingly required to adapt to changes in their livelihoods that increase their vulnerability to risks associated with climate change, HIV and AIDS, STIs, water supply and sanitation, coastal erosion, disappearing traditional knowledge and increasing income generating activities. The challenge for Kiribati and its education partners is to work together to find a way to get the best from these changes that are reshaping the life chances and opportunities of our young people. Nurturing our children and young people in Kiribati to become wise and responsible citizens able to adapt to, and participate in, their changing world. The Ministry of Education has through its Education Strategic Plan (ESSP 2012-15) embarked on a major reform programme, the Kiribati Education Improvement Program (KEIP) developed in partnership between Kiribati and its development partners in the education sector. It is the framework within which the major donors in the education sector provide support to Kiribati in addressing its most pressing educational issues up until the year 2020. It reflects Kiribati’s commitment at the international level for better and equitable education outlined in the Millennium Development Goals (MDG): Objective 2 and detailed in the six Education For All (EFA) goals. It also reflects Kiribati’s regional commitments to the principles of the EFA goals outlined in the Forum Basic Education Action Plan (FBEAP) endorsed by the Forum Education Ministers in 2001, and the ensuing Forum Pacific Education Development Framework (PEDF) endorsed by Forum Education Ministers in 2009. This ESSP is also aligned with the Kiribati Development Plan (KDP) 2012-15, which prioritises human resource development as a key focus in the country. 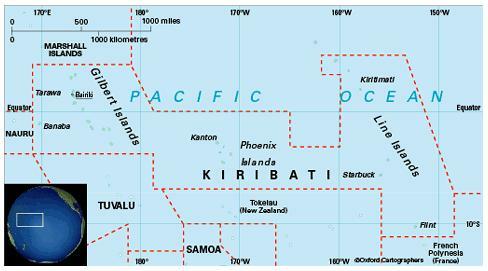 The geography of Kiribati challenges the delivery of services and the ministry has resolved to decentralise many decision-making processes. That process engages communities in management and responsibility, thus developing a sense of ownership of their schools. Currently there are 94 primary schools, 24 junior secondary schools, and 16 senior secondary schools (three government and 13 church run). Education is free in government schools. The main government ministry in charge of the education sector in Kiribati is the Ministry of Education, Youth and Sport Development. Control of educational issues is given to the Minister of Education who appoints a permanent secretary. Administration is very centralised with little authority given to individual schools. The Government receives aid from Australia (AUSAID) and New Zealand (NZAID), as part of bilateral agreements, to help provide these education services. The Ministry of Education receives the largest portion of total Government budget every year, primarily due to the salaries of teachers. It also provides subsides to Church schools. In addition to the ministry, there is the Kiribati National Advisory Committee for Children, and the regional exam board South Pacific Board for Educational Assessment. There are nine years of compulsory education starting at age six, comprising six years of primary school and at least three of secondary. Some 79% of pupils complete primary school (2003). The school year starts in January.